When water-skiing, two persons in the boat (an operator and an observer) must be at least 12 years old. No water-skiing between sunset and sunrise. It is unlawful to operate a boat in a reckless or negligent manner, or while under the influence of alcohol or drugs. 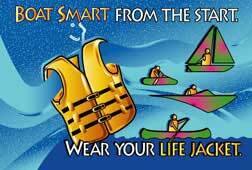 One Coast Guard approved Personal Flotation Device (PFD) must be carried for each person aboard. A valid registration must be on board and correctly displayed. Water-skiing is not permitted within 100 feet of docks, shore, boats, or other people. Navigation lights must be displayed between sunset and sunrise. A Boating Safety Certificate is required for those born on or after July 1, 1972. A vessel may not exceed 26 feet in length, except pontoon boats which may not exceed 30 feet. Engines may not exceed the manufacturers recommended capacity, or total displacement of 550 cubic inches, whichever is less. Parasailing is not permitted on the lake. Vessels shall be muffled so as not to exceed state noise level limits. No garbage, sewage or other waste materials may be discharged into the lake. Aircraft are prohibited on the lake and buffer strip. Personal Watercraft (PWC) may not be operated on the lake between 11 a.m. and 4 p.m. on: Saturday, Sunday andholiday of Memorial Day weekend and Saturdays, Sundays and holidays from July 1 through Labor Day. On Deep Creek Lake, a person may not operate a vessel towing a skier, an aquaplane, or similar device within 100 feet of any bridge on Saturdays, Sundays and holidays from 11:00 a.m. to 4:00 p.m. between the Memorial Day weekend and Labor Day. A person may not operate a vessel at a speed in excess of 3 knots within 100 feet of the shoreline anywhere on the lake, except that a person may tow a skier from a dock or shore and then immediately exit the restricted area. Sunday, and holidays from the Memorial Day weekend to Labor Day in that area which lies between Beckman's Cove and North Glade Cove. A person may not operate a vessel at a speed in excess of 3 knots at any time in the following areas: Meadow Mountain Run, east of the Meadow Mountain Bridge; McHenry Cove, north of the restriction buoys; upper end of Red Run Cove, southwest of therestriction buoys; Thayerville Cove, southwest of a line of buoys extending from the easternmost point of the Arrowhead peninsula; upper end of Hoop Pole Cove, southwest of the restriction buoys; and upper end of Pawn Run Cove, northwest of the restriction buoys. Deep Creek Lake Recreation Area Office, 898 State Park Road, Swanton, MD 21561 or call (301) 387-4111. - Memorial Day through Labor Day call (301) 387-1101 for water-related problems.